In this field, you can define the maximum amount of characters that may be entered. If you leave this field blank, the maximum of 255 characters will be defined. The edit field is not suitable for entering more characters. Use the text area instead for longer texts. 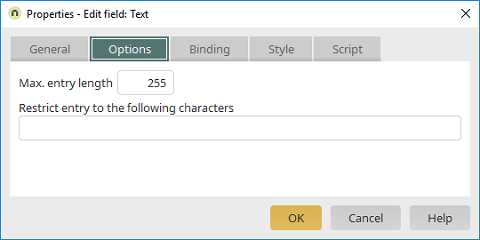 If a user exceeds the maximum number of characters, an error message will appear. Here, you can specify which characters may be entered into the field. Entering other characters into the field will not be accepted.